With 95 fresh cases of dengue reported from various areas of the Capital during the last 24 hours, the total number of patients rose to 1,373 today. The death toll climbed to 28 as the disease claimed one more life in the city. Delhi chief minister, Ms Sheila Dikshit, has announced that the government would constitute Task Force in government departments for improving the functioning and delivery of public services. Addressing the concluding session of the three-day Bhagidari Workshop on ‘Improving Public Service Delivery’, Ms Dikshit said that ‘Bhagidari’ movement in Delhi had gained momentum and it had helped empower the people. In view of the heightened terror threats ahead of Divali and Eid, a surprise mock bomb blast and fire drill was carried out on the underground section of the Metro on a train last night between Patel Chowk and Rajiv Chowk to test staff preparedness and the speed with which passengers can be evacuated. Municipal Corporation of Delhi (MCD) has computerised its engineering department to help expedite the sanctioning of building plans in the Capital. The family of Devender Manchanda, the suspended Delhi Police Inspector who allegedly committed suicide, today filed a complaint demanding an inquiry into the circumstances that led to his death. Punjab Finance Minister, Mr Surinder Singla, released a book by Mr Shashi Verma, ‘You are God – The Bhagvad Gita as never before’, at a well-attended function in the Capital. Delhi Tourism, in collaboration with the Ministry of Tourism and Culture, Government of NCT of Delhi and SEHER, is organising the annual Festival of Indian Classical Dance titled ‘Ananya’ at the Purana Quila. Tihar Jail, Asia’s biggest prison complex, is abuzz with activity with the authorities planning to bring some light into the lives of the inmates and make this Divali ‘special’ for them. Delhi Health Minister, Mr Yoganand Shastri, today said obesity was a growing problem among children and it was the responsibility of the society to find its solution. A minor fire broke out in the Red Cross building on Parliament Street here today. A man on trial for more than two dozen heinous cases escaped unhurt when three youths from a rival gang tried to fire at him at point-blank range on the court premises this morning. The local police have arrested four persons who had allegedly stolen Kishan Vikas Patras (KVPs) from Guwahati in Assam and were trying to take a loan from a bank by mortgaging them. The police today claimed to have busted a racket involved in the distribution of duplicate FMCG products of many popular brands in the Capital, with the arrest of one person. The latest victim of the mosquito-borne disease is 25-year-old Farhana, a resident of Hauz Rani, who succumbed to the viral disease at AIIMS today. Various hospitals in the Capital continued to be deluged with the patients with dengue symptoms, a senior official of the MCD said. The official said that of the total cases till this morning, 892 were from Delhi and the rest from the neighbouring states. Despite the intensive fogging and fumigation drive, several parts of the Central Zone, Najafgarh, Shahdra (North) zones and areas mostly along the banks of Yamuna river, continued to report a high number of dengue cases. “A large-scale construction activity is being carried out in various parts of the Central Zone, which has led to open sewers that are fertile breeding grounds for the mosquito,” said the Municipal Health Officer, who visited the area. Another problem being faced in the area is irregular water supply at unauthorised construction sites that leads to storage of water for various purposes. 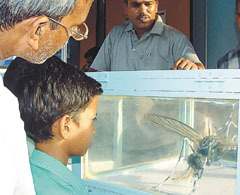 The Delhi Health Secretary said that a team of medical experts toured the trans Yamuna area where they found mosquito breeding at various places. Additional manpower was deployed in the area for fogging and fumigation. At AIIMS, which is facing a dengue deluge, 39 new patients were admitted in the past 24 hours, taking the total number of patients undergoing treatment for the viral disease to 165. Thirty-four patients were discharged from the institute during the period. More than 15,500 patients had been screened at the AIIMS emergency OPD since October 3, doctors said. An average of 1,000 people are being screened daily at the emergency OPD. The hospital is conducting about 1,600 platelet-counting tests daily with the help of four separator machines, functioning round-the-clock. Only emergency and dengue patients are being admitted to the hospital. “We have been told only to admit dengue and emergency patients. People have been waiting for their renal, heart or liver surgeries for years are being turned away,” he pointed out. Delhi chief minister, Ms Sheila Dikshit, has announced that the government would constitute Task Force in government departments for improving the functioning and delivery of public services. Addressing the concluding session of the three-day Bhagidari Workshop on ‘Improving Public Service Delivery’, Ms Dikshit said that ‘Bhagidari’ movement in Delhi had gained momentum and it had helped empower the people. Success of the programme had inspired other states to adopt this unique model of government-citizen partnership, she claimed. The Chief Minister said the ‘Bhagidari Movement’ was started with an objective to involve people in decision-making at various levels of the government. “The movement has provided open, transparent and responsive governance, application of information technology and e-governance apart from partnership of willing citizens in day-to-day affairs of the government,” she said. She also called upon Delhiites to seriously concentrate on strengthening ‘Bhagidari Movement’ and sincerely try to maintain its apolitical status. 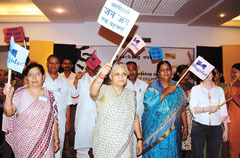 She further said that a number of government services in Delhi of her government have become on-line. The people have been provided a mechanism to interact with the government even sitting at their own place without visiting the government offices, she said. Ms Dikshit claimed that the Right to Information Act had proved to be an effective instrument to obtain information from government offices. It has added to transparency and openness of the administration. “The RTI is a revolutionary beginning, which has helped in making administration responsive, effective, people-friendly and answerable,” she added. The Bhagidari Workshop, as one of the fora, would go a long way in understanding the real essence of the RTI Act, she added. Around 240 officials of 58 public dealing departments of Delhi Government and 30 members of citizen groups participated in the workshop. According to a DMRC press note, the entire evacuation was completed in less than 10 minutes. As per the drill, the train operator informed the DMRC Operation Control Centre (OCC) that a bomb had exploded in the train, causing a fire and injuring passenger. The OCC immediately informed the disaster management group, fire service, police and bomb disposal squad. The project, which has been implemented at a cost of Rs 80 lakh, will be initially tested for user acceptance in Central and Shahdara zones. It has been named as ‘Engineering Department Information System (EDIS)’ and is designed and developed by the Mumbai-based ABM Knowledgeware Ltd. In the complaint lodged at Mukherjee Nagar police station in North-West Delhi, the family recounted the charges levelled by Manchanda against the City Police Commissioner, Mr K K Paul, that he had been ‘intimidating’ him. In such circumstances, the complaint said, an inquiry should be conducted to bring out the truth. Manchanda had, in his suicide note, accused the commissioner of harassing him for lodging an FIR against one Vineet Aggarwal, a charge denied by the police department. The body of Manchanda (55) was found on the Barakhamba Road near Connaught Place yesterday. Though the police is yet to receive the post-mortem report, there are strong suspicions that he had consumed some poisonous substance. The inspector was suspended on October 12, 2004 after a departmental inquiry found him guilty of registering a ‘false’ case against Aggarwal, a resident of Civil Lines in North Delhi. It was found that he had registered the case against Aggarwal and his father in September, 2004 on the basis of a complaint by one Sayeed Ahmed allegedly without verifying the claims made in it about the ownership rights of a piece of land in possession of the Aggarwals. Mr Verma’s latest effort is third in the series of books released by the Nobel Foundation to revive knowledge about the country’s ancient scriptures. The volume, in its lucid elaboration of the Bhagvad Gita, explains how the real battle of Mahabharta has to be fought by the man within himself and against enemies like ego, desire and the delusion of doer-ship. Speaking on the occasion, Mr Singla said while the man had acquired abundant knowledge of the world he lived in but was still lacking in “the self-knowledge that Prophets of yore revealed. The Bhagvad Gita delves deep into this knowledge and tells us that we are eternal-beings who neither die nor cease to be but keep changing the body birth after birth,” he said. “The whole world thinks that death is imperative and every person eventually die. Facts also support this thinking, since no one has been able to free himself from death. However, prophets like Lord Rama, Guru Nanak and Jesus Christ demonstrated that it was possible to be free from death and leave the world with the body,” Mr Singla added. Mr Verma said he had devoted 10 years of his life in deciphering wisdom imparted by Lord Krishna. “The timeless dialogue between Arjuna and Lord Krishna is all in narration of Yoga of immortality, a secret science which when decoded and applied to life can liberate us from seemingly endless rounds of birth and death,” he said. ‘Ananya’, now in its 5th year, has come to be known internationally as one of the most prestigious dance festivals held at a historical site. The festival of Indian classical dance features the major classical forms on a single stage. The festival is organised with an aim at democratising culture in the city. This year ‘Ananya’ will feature some of the foremost dance groups in the country. Commencing with Odissi by Nrityagram from Bangalore, the event will include Kathak by Parwati Dutta and group from Aurangabad, Mohiniattam by Dr Kanak Rele and Nalanda group, Mumbai Contemporary dance by Natya Stem Dance Kampni, Bangalore, and Bharatanatyam by B. Bhanumati and group from Bangalore. The five-day treat for Indian classical dance lovers in the Capital that started here on Thursday and will culminate on October 16, will have each day featuring one hour of major classical dance forms in group choreography. On the second day, a group under the tutelage of Parwati Dutta from Aurangabad gave its performance. Guru and researcher Parwati Dutta is a versatile Kathak and Odissi danseuses, who started her dance journey at the age of three in Bhopal. She specialised in Kathak under Pandit Birju Maharaj and trained in Odissi under Madhavi Mudgal. On the third day today, Dr Kanak Rele and her group in Mohiniattam enthralled the audience. A pioneering dance educationist and leading exponent of Mohiniattam for the past 40 years, Kanak Rele has strived ceaselessly to revitalise and popularise the form which was facing certain extinction. On October 15th, a very innovative and contemporary dance will be performed by the Natya Stem Dance Kampni. Termed ‘strikingly original’, the Natya STEM Dance Kampni (NSDK) is a collaboration of the Natya Institute of Kathak and Choreography and the STEM Dance Theatre. Using indigenous movement disciplines, the Natya STEM Dance Ensemble has created a varied repertoire, which includes Kathak, dances of India, contemporary dance and ballets on mythological, historical and contemporary themes. Every nook and corner of the jail complex will be decorated and lit up with nearly 50,000 candles and 55,000 earthen lamps. A total of ten quintals of sweetmeats have also been ordered, sources in the jail administration informed. Speaking at a conference on ‘Management and Presentation of Children and Obesity through Nutrition Strategies and Physical Activity’, he said with the shifting of population from rural to urban areas and changes in lifestyle and food habits, the incidence of obesity among children was increasing. It was very important to change the lifestyle of children and encourage them to get involved in outdoor games and exercise, he added. The Minister appealed to all the parents that they should pay more attention to the eating habits of the younger children to avoid health-related complications later in life. Schools should also include in their curriculum an awareness programme about good food habits and sports activities, he added. Fire Department officials said the blaze, which broke out at about 12.15 pm, was extinguished within 20 minute by six fire tenders. No injuries or casualties were reported, they added. The district’s Senior Superintendent of Police said Manjeet, on trial for 26 cases of murder, attempt to murder, robbery, theft etc, was being produced in the district courts in the morning when three youths, led by Maheshi, alias Pawan, a resident of Uttar Pradesh, took out a pistol and tried to fire at Manjeet. Two police constables, Som Chand and Manoj Kumar, who were in plain clothes behind Manjeet, noticed Maheshi’s movement and immediately caught hold of him. His two accomplices tried to escape but they were also overpowered by separate police teams, the SSP claimed. Manjeet’s cousin, Surjeet, who is his rival, is a known criminal with around 20 heinous cases against him. Surjeet, who is lodged in jail, might have taken the help of Maheshi for eliminating Manjeet, observed the SSP. The SSP informed that Manjeet and Surjeet, both aged around 35, were from Gurgaon village and allegedly partners in stealing vehicles in 1997. Later, they had a dispute over the share in spoils. This led them to part ways. The SSP said Surjeet’s father was murdered by Manjeet and Manjeet’s mother by Surjeet. Just two months back, an auto driver, Narayan, who was close to Surjeet, was allegedly murdered by someone close to Manjeet. The local Senior Superintendent of Police said that the manager of Karur Vyas Bank, Mr Uttpal Kant Sarkar, complained to the police that four persons, Ramesh and Rambir, both residents of Gurgaon, Maninder, alias Ajit of Sonepat, and Sachin, alias Pawan of Delhi, had sought a loan against 300 Kisan Vikas Patras worth Rs 5,000 each with the total value coming to Rs 15 lakh. However, these KVPs were found to be stolen from Guwahati in 1997. The accused had reportedly also got a letter issued by a post office situated in Delhi to the local Karur Vyas Bank confirming that the KVPs were original. This letter and the stamp on it were found to be fake in the investigation, added the SSP. The police have lodged an FIR under Sections 420, 465, 467, 472, 468, 473, 471, 474 and 120-B against them and seized a luxury car and a motor cycle from their possession. Pramod Kumar Gupta, a resident of Gurgaon who was allegedly operating the racket from a plot in Bijwasan here, was arrested and sent to two-day police custody, the Deputy Commissioner of Police (Economic Offences Wing) said. Acting on a tip-off, EOW sleuths raided the premises owned by Gupta in Bijsawan last Sunday and seized a huge quantity of duplicates of popular products.